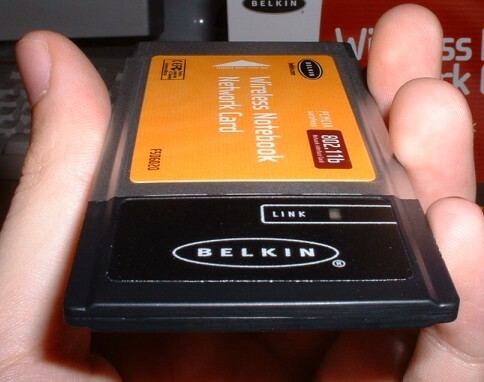 Belkin has been working hard to bring quality wireless cards to market. They support both a complete Wi-Fi and Bluetooth line of cards, some of which are compatible with PDA's (specifically CE based devices). 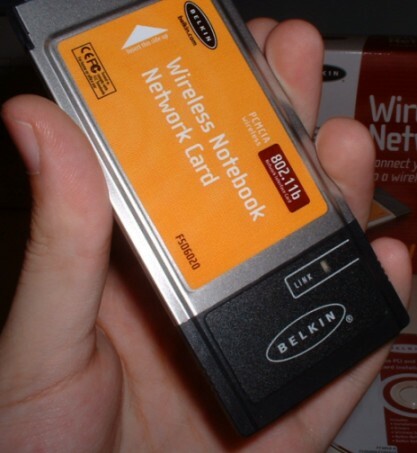 The Belkin "Wireless Notebook Network Card" has been on the market for some time, and though does not officially support Pocket PC, it can be used as a powerful solution with devices like the Compaq iPAQ and Casio E-200 (or other products that support PCMCIA cards). This card is one of the most powerful PCMCIA Wi-Fi cards on the market with a maximum range of 1800 feet and keeps a 11Mbps connection (under optimum conditions) at up to 590 feet. This range comes from its output power, which is higher then almost every other PCMCIA wireless card including the Orinoco World. But for this power, battery life is at stake. It is a trade off, but in my opinion optimum connection is better then battery life. The first thing you notice about this card is the massive antenna. This actually is not the biggest antenna on the market, but it is substantial. The antenna alone is almost as long as a standard CF memory card. 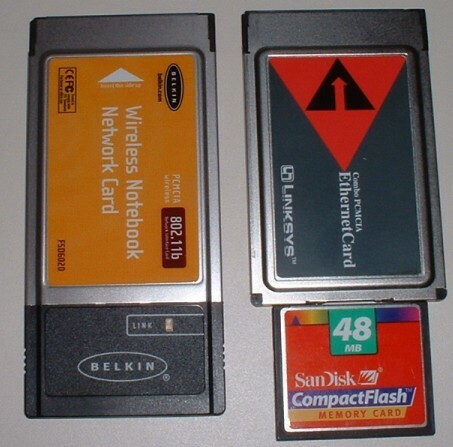 The standard for PDA use is a CF card for wireless which often comes with an antenna of about half the length of the Belkin's. There is a trade off once again. The larger antenna helps to increase range (along with the power boost), which I have noticed in comparison to my tests earlier in the year with a Socket/Symbol CF Card. 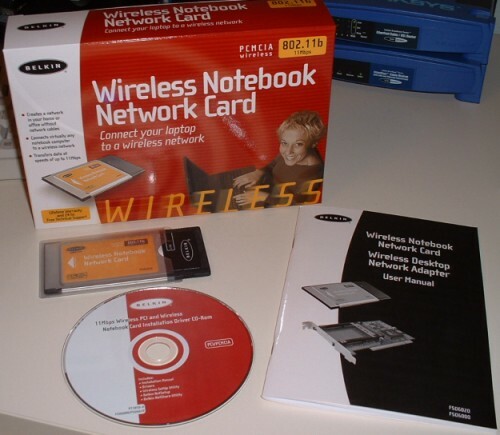 To better illustrate some of the differences in the specification of this card, the table below compares it with the Linksys PCMCIA Wireless Card (WPC11 v.3) and the Orinoco World PC Card. Belkin uses a high amount of power for transmissions which means it is able to transmit them farther. Similar goes for receiving power usage, though it takes much more power to transmit then to receive. In the sleep state, 20mA is similar to the power required for a memory card to read and write. 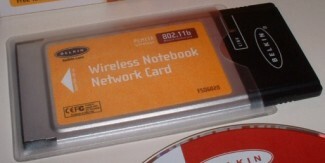 As noted earlier, this card is not officially supported as being Pocket PC or Windows CE compliant by Belkin. Chris De Herrera (Mobile MVP and owner of cewindows.net) knows otherwise. Via his site I was able to find that this card does in fact contain the correct components to use Compaq's Wireless Card Driver. This driver will work for WEP encryption (Wired Equivalent Privacy) cards like this one. I soon found out that this driver comes with the same software that Belkin provides for your desktop (just scaled for the Pocket PC). You can actually use the manual that comes with the card if you are unsure of what settings you might need with the card. The one thing that is not in the manual is checking your Pocket PC's Connection settings (which I will get to in a second). My connectivity to an access point was very simple. My primary use for this card is connecting to a campus Wi-Fi network at school. Once I had installed the driver and preformed a soft reset, my device began searching for connections. 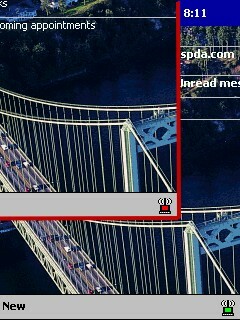 It quickly was able to find the campus Wi-Fi network and get a stable connection. Initially, Pocket Internet Explorer would not use the WiFi card, but all that I need to do was go into Settings -> Communications -> Communications and change the settings around (currently mine works fine with Internet, Internet, Work). It was as simple as that and I was rolling. For my primary tests of this card I was not right next to the access point, but instead two classrooms away (as you can see in the picture, 66% signal strength and 11Mbps). I was still able to hold a connection when walking down the halls up to about 125-150 feet away from the access point. This is a pretty good connection distance indoors, and I was pleased with how well the card managed the connection and then found other networks when I was out of range of the first. 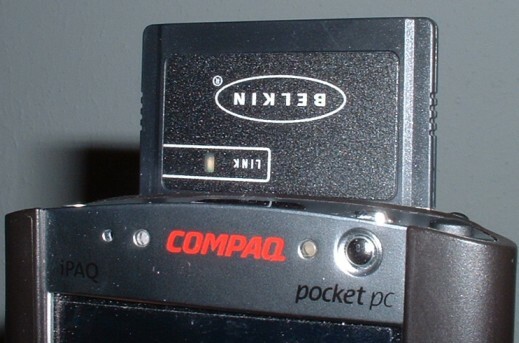 On the Today Screen, the Compaq software shows an active connection or lack of one. 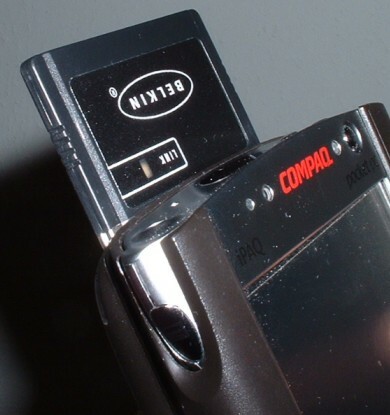 The Belkin card also contains a "Link" light which will flash when it is searching and will stay solid when there is a connection. After using the card and my device actively with the screen at medium brightness, my devices batters were only down 10% and my PCMCIA sleeve showed a less the 10% loss. Though this card requires more power then others, I would still expect to be able to use my device for upwards of three hours. Overall I have been very pleased with the performance of this card. Before buying, I read some consumer one-line reviews of this product, and the card lives up to everything I read. It really is a powerful card that gets a good solid range and though uses more power then other cards, turns out to be a good value. Belkin also offers a Lifetime Warranty on this card that is just proves the confidence Belkin has in this product. I will be using this card almost daily in class and am expecting a great performance, but have no fear that this card will be able to provide that. This means, this product is a very good product, though has some features which could be improved. This product embodies quality in its design and application, and is something I would use though I think there are still areas for improvement. Weigh the pros and cons before purchasing, but in my opinion this card is a good buy.